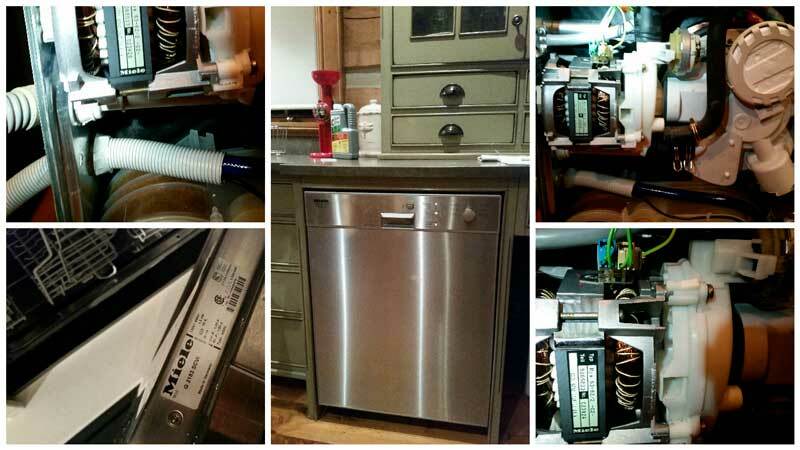 Same-day dishwasher repair of all well known brands. Convenient scheduling online and by text message. Plus, FREE house-call with your repair. While it’s still possible to wash your dishes by hand, when you’re accustomed to using a dishwasher to lighten the load, breakdowns can be a disruption. The highly trained technicians at FIX Appliances CA can repair your machine quickly and affordably. Call, text or schedule online your dishwasher repair in Barrie, Simcoe county or Toronto and GTA areas. A broken dishwasher is frustrating and doing the dishes by hand is time-consuming. FIX Appliances CA understands you want repairs to be done quickly, so we offer same-day service at no extra charge. Our skilled technician can take care of most problems in one visit. Set up an appointment today. Enjoy this special offer for your Dishwasher repair. Save $20 on Dishwasher Repair For new customers only, for Dishwasher repair. Within 24 hours our appliance was fixed with the proper Miele part ....before he did the repair he explained the problem and all costs to fix it...we would not hesitate to call them for any future appliance repair. What a great experience to deal with FIX. Initial contact for service was very polite and positive. Appointment time was prompt and timely. Service repair person (Oleg) was extremely efficient and knowledgeable to assess the problem and subsequently order parts and repair. His work was efficient, neat and tidy. We are very pleased with the work and have already mentioned this company to our friends. We will not hesitate to request repair service again if and when required. Congratulation on your high standard of business ethics and practices. 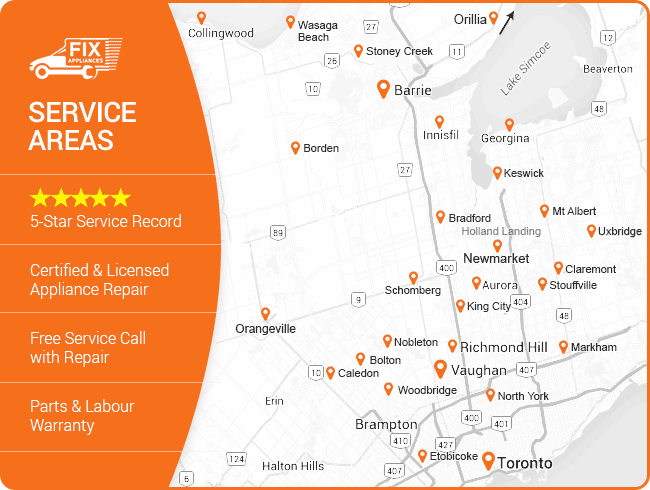 FIX Appliances CA is located in Barrie and Bradford, Ontario. Our local dishwasher repair technicians also cover Simcoe County, Toronto and GTA areas. Check the map to confirm the service area nearest to your city or town. Each service truck carries an inventory of common replacement parts so your dishwasher repair can be completed the same day. Miele, Samsung, Whirlpool, Frigidaire, GE, Maytag, Bosch, Kenmore, KitchenAid and more brand name dishwashers. No, remove excess food, but pre-rinsing is not needed. New dishwashers and soaps are designed to remove food particles. Pre-soaking may be needed for dried-on food. How do I avoid spots and cloudiness on glasses? use about half the amount to reduce corrosion. Hard water can cause spots, so you may need to invest in a water softener. What kind of detergent is best? detergent. Brand names tend to work better than generic brands too. How should I load the dishwasher? be face down for safety when removing. Plates, pots and cutting boards should be placed on the lower rack leaning toward the center spray arm or facing down. Plastic, glasses and long utensils should be placed on the upper rack. A filter located under the lower spray arm is generally removable. Clean it with a soft, bristled brush regularly. Replace if it becomes damaged. Wipe down the area between the door and bottom of the dishwasher to remove food particles. Clean out spray arm holes with a needle. Use a dishwasher deodorizer to keep it smelling fresh and prevent mold growth. Special cleaning wipes are available to safely remove fingerprints from exterior stainless-steel doors and handles. Use a damp, non-abrasive cloth for all painted finishes. It may be tempting to fit every dish possible into one load. Overloading will restrict water spray patterns that will require rewashing and wasted water. Replacement tips for the upper and lower racks are available in a variety of colors. Touch-up paint is available to cover worn and flaking paint that will rust if left untreated.